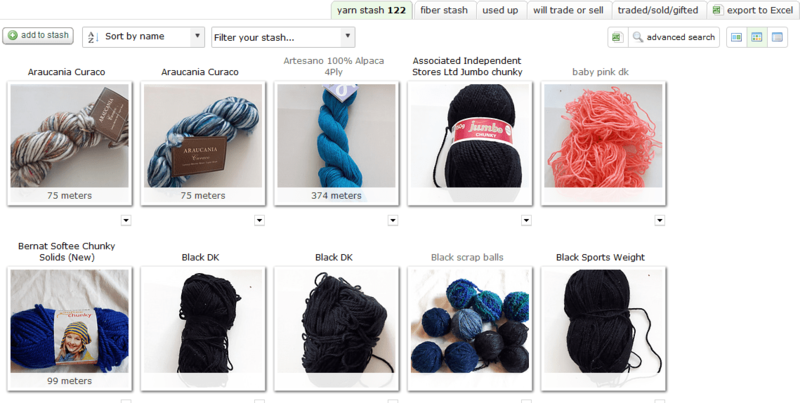 So up till recently I haven’t been using Ravelry to its fullest extent. Only in the last year have I really been using the favourite function and putting them into bundles so that I can find them more easily. Currently I am trying to use the stash function to organise all the wool in my stash. One of my biggest issues is knowing what I have, I have inherited a lot of wool from my Nan, most of which comes in small balls with out any indicator of what it is. Only a few of the inherited wools come in more than half a ball volume so finding projects for them is proving hard. In addition my wool stash is kept in two very distinct locations so keeping track of what I have where is awkward too. Over this past week Nikki and I have photographed pretty much every ball of wool we own and have added them to Ravelry. We have managed to add weights to the partial skeins in Southampton but as I don’t currently own a set of scales in Poole that stash is currently waiting to be weighed. As you can see some of the balls of wool are rather scrappy but most of those are balls that have been handed down to me. That bright pink (or the evil love child of flou. orange and baby pink, as Nikki calls it!) has now been caked after much frustration from both of us. There are lots of little balls of left over wool from many of my Nans projects as well as some new small balls that Nikki bought recently. Thankfully 90% of these are roughly DK weight so could be used interchangeably but I really need some ideas to use up small amounts of yarn. Nikki is a big fan of me making more of the little stockings that I have made over the last few years. They were initially created to use up some of the even smaller scraps of yarn that I inherited, hence some of the random colour combinations. Luckily I have a whole bag of different red wools now! I’d be keen on hearing if anyone has any ideas of small scrappy projects that I could use the small bits of wool for. Or any small scale colourwork charts that would work for the stockings that I will end up making? Going through the whole of my yarn stash has reminded me of some of the nicer wools that I have been “saving up”. I have a couple of balls of baby cashmerino and some other unidentified wools which feel very similar that I have to combine at some point to make a very snuggly something. Lots of plotting is going on in my little head, but I have to be careful as I have a couple of big projects on the go at the moment and need to make sure that I don’t inundate myself. Although now I have re-found it I can’t wait to cast on my Sock Yeah! yarn… I just need to work out what to make from it. I’m off to go see what additional functionality there is on Ravelry that I’ve been missing out on. If any one has any great tips and tricks, be sure to let me know! Yeah I just wish there was one for sewing too. 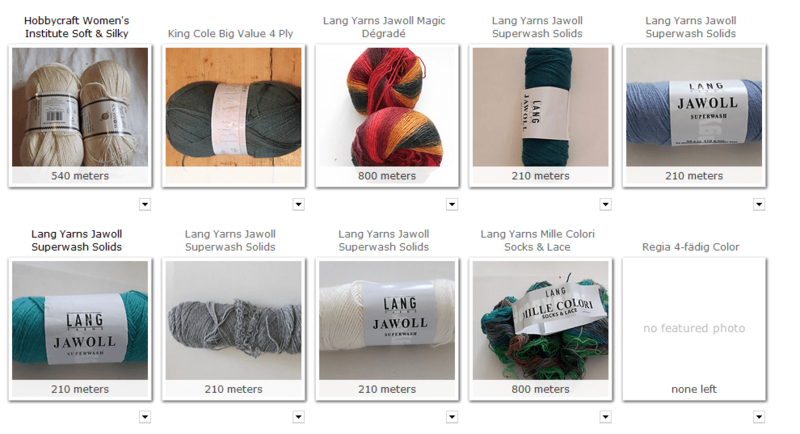 My yarn stash isn’t too bad – that is, I have loads of it but all in amounts that I bought for certain projects (not started yet) so I sort of know where everything is and what it’s for. Now, fabric is a different matter of course.